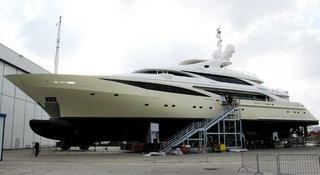 ISA is preparing its first 63 metre build for a launch scheduled for early April 2010. With sleek, aggressive lines by naval architect Andrea Vallicelli and an interior in bamboo and natural materials by Patrick Knowles, she's sure to make a style statement at launch. She is the first of three 50m+ yachts planned to launch at ISA this year.